Microsoft’s cloud based Project and Portfolio Management offering, Project Online, has brought a traditionally enterprise level tool to the masses. Small to medium size companies can now afford to move their portfolio management from excel to a bona fide system. The previous barrier to entry, purchasing hardware, has been removed by Microsoft hosting the data. Since the data is no longer onsite, the Open Data Protocol (OData) was chosen as the method for exposing the data for consumption. Today we will focus on editing the data string. I will use two simple methods that are easy to replicate. I have chosen the projects table and created a sample report that displays a project list with durations. Think of this as one pane of a dashboard report. To speed data transfer, I will limit the data pull to only the data displayed. I will then clean up my data, by filtering out unwanted projects. 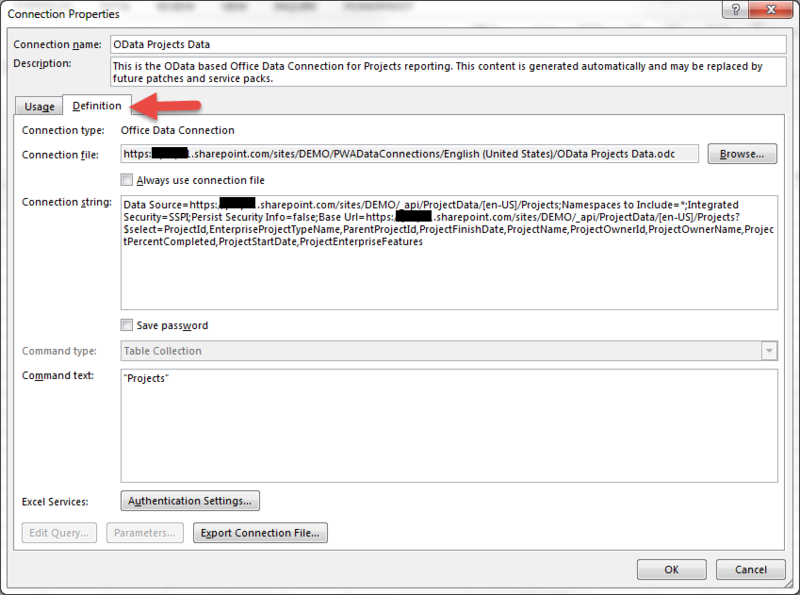 Open the report or Excel file to modify. In pop-up window, select desired connection (in the example, I only have one to select from). 6. Click on the Definitions tab. I want to target only the data that I intend to display. I will use the $select query option to do so. Experience tip: Copy the connection string into OneNote, Word or Excel to make the modifications as a means of saving the original and safe keeping of the one that works. Notice that two projects were removed, ZZ Test Delete Site and Timesheet Administrative Work Items.